This entry was posted in Technology and tagged Andy Gavin, Author Website, blog, Darkening Dream, Languages, PageLines Platform, PHP, Plug-in (computing), Programming, Rails, Ruby, Ruby on Rails, Untimed, Website, WordPress, wordpress.com. I’ve 110mb.com and I really like it’s FTP File Manager to put files up. I don’t think much is charged either ( I just use it for free). I just use that because I’ve put the most work into that host, though. These might not be what you’re looking for but http://www.000webhost.com/ is probably the best. It supports Ruby on Rails (for a teensy price), Python, Perl, PHP, unlimited FTP accounts, unlimited data transfer and all that jazz. I’ve never bothered with it’s $4.84/month deal, but I hear a lot of good things about it and I guess it’s a pretty good start. I can sometimes get 50,000 hits in a day (not usually, but always 500-1000) so I don’t want a free/cheap shared platform, it will crumble under that. I see. In that case, my money goes on something you already mentioned here, and that’s Media Temple. I’ve read some reviews lending all sorts of praise on that platform, and because of the fact that it’s been around for quite while. So your media temple experiences have been good? It’s pretty mixed on the web. You use grid or vps? I can’t comment on hosting, because I’ve never actually tried it myself. I have however tinkered with PHP in the past. PHP(and other languages I’m sure) don’t automatically escape troublesome characters like double and single quote, etc. This leads to problems like SQL injection, execution of arbitrary code, etc. As a rule sanitize every input. Generally instead of removing characters like “‘* etc you’d just replace them with their HTML encode equivalents. (< for <) Replacing will disable everyone from posting HTML code. This is both a good thing and a bad thing. It’s good because it keeps people with less than your best interest in mind from posting script, frame, and iframe tags. I’ve found that it takes less work to disallow all HTML and then allow a few harmless back in. (like and ) I also disallow * because it’s a MYSQL operator. These are just a few that I disabled, there were others as well, but I can’t think of them at the moment. On a side note, if you’re running your own server you can use whatever language you want. You don’t absolutely have to use PHP. You are proficient at LISP and Ruby, so there’s not really anything saying that you can’t use them in place of PHP. Just so long as your language performs all the functions as well or better than PHP I don’t really see a problem in using it. I heard LISP has no problems with the contents of strings. You’d still have to do some mop up with the HTML encode characters, but… It’d probably be a lot more trouble than it’s worth doing it this way, but you could if you got too annoyed with the syntax. Yeah I learned all about injection when I did Flektor.com. If I was going to write the site entirely from scratch I’d use Rails, but I don’t want to have to do all that work. I think I can use WordPress to do most of it — and for that it will be easier to just use PHP as it’s a PHP framework. Even if PHP is a kind of ghetto language. 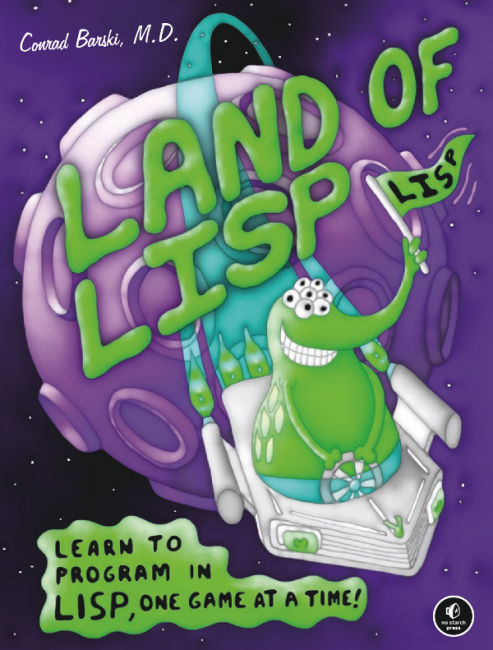 Andy, I want to know what you think about this book called “Land of Lisp” (http://nostarch.com/sites/default/files/imagecache/product_full/lisp.png). Have you ever heard about it? I’m a level 0 13 year-old programmer that has never seen anything at all about any type of programming at all. What would you suggest to me if not this? Sorry in advance for taking your busy awesome-being time. I’ve had a mixed experience, I run a html site, never had the slightest problem, but maintenance takes forever, built my own PHP ‘apps’ into my pages, using only o’reillys php book. I also run several blogs with wp. Had many problems with hacking, the worst 2 years ago, when despite the great help I got from Hostgator, I could not stop the iframe injections , they just kept coming, the only solution to stay online was to move to another host. But I went back eventually ,I now carefully select my plugins and keep everything up to date following the advice on the hosts pages and everything is running fine again. The business side has to come first so I have to come down on the side of simple wp blogs.